33 ¾ x 29 ⅜ in. Poet and painter Marie Laurencin was closely associated with the Parisian avant-garde movement. 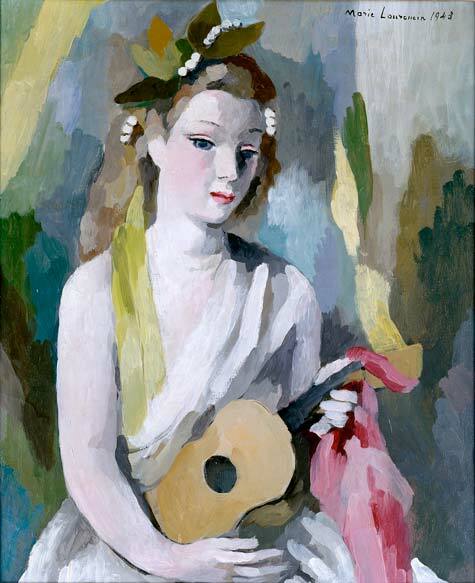 Woman with a Guitar demonstrates Laurencin's schematic treatment of human anatomy. These stylistic elements were partly based on her knowledge of the art of Africa, including tribal masks. The sitter's porcelain skin, demure mouth, and widely set almond eyes are particularly striking, and the flat planes of pastel hues are typical of her work. Critics have referred to Laurencin as a sophisticated form of modern primitivism. Laurencin achieves an ephemeral elegance with her unique combination of simplified forms, graceful lines, and pleasing palette. Reflecting her own interest in the literary, performing, and visual arts, Laurencin often painted figures in the guise of the Muses, draped in togas and carrying the attributes of their art.